Yoga Harmony is thrilled and honored to welcome international yoga teacher Rosalind Langer to our studio. 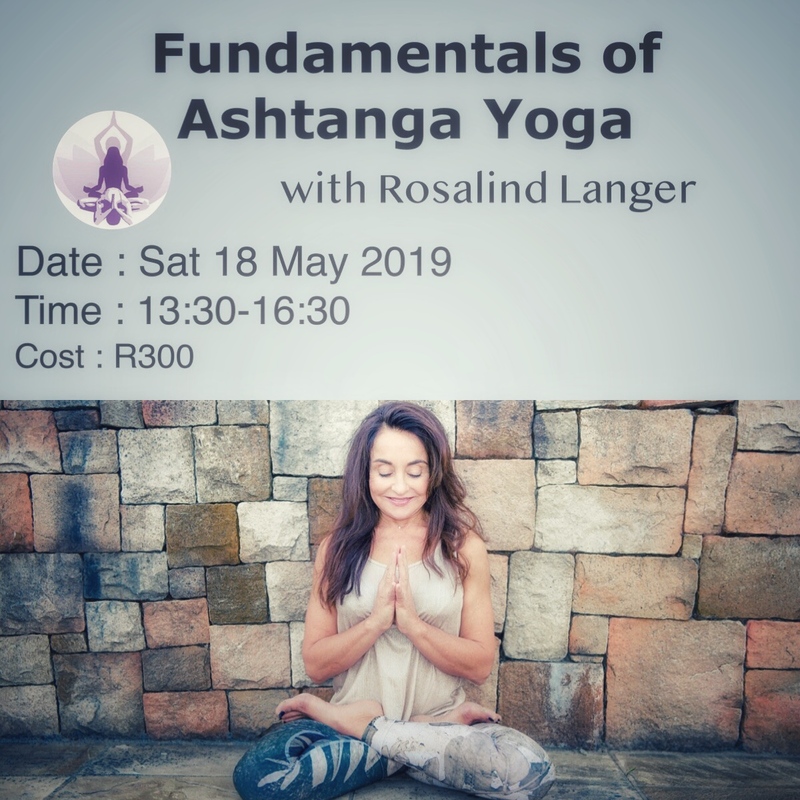 Join Ros in a three hour yoga exploration of the the fundamentals of Ashtanga yoga. All levels welcome!! and using them to further understand the Tristhsna method. We will briefly explore the “Eight limbed Yoga path” of Patanjali . This workshop is for the curious: beginners as well as experienced yogis and those wanting to delve even deeper into their practice. Her teaching is inspired by the belief that postures should be held, and that they should be slowly revealed. “In the slowing down we centre inwards, and in moving inwards, we are able to enjoy a deeper union and therefore a more focused practice. This becomes the medicine, the therapy, the effort and surrender” . The discipline of this practice has become devotional for Ros, and it is in this devotion that she feels this practice is much more than something physical. Ros is a highly qualified Ashtanga and Vinyasa teacher with years of experience sharing yoga to the community. Ros completed her first asana teacher-training with Jacqueline Ivory of Jai Yoga and completed Level 1 Teacher Training with John Scott to further her development as a teacher. Ros was awarded a scholarship by John to complete his Level 2 training. Ros has completed an 8 week mindfulness program, and after completing a number of Virpassana courses she has added meditation to both her personal practice and her teaching practices. with Freda certified internationally trained at The House of Yoga in London and certified Baptiste yoga teacher. Learn to fly high, build strength and balance. Get upside down and look at the world from a different angle during this fun and invigorating workshop with Freda. You will play around with various asanas - head stands, shoulder stands, and hand stands - whilst advancing towards a floatingvinyasa. Inversions inspire flexibility, strength and courage, so take this chance and challenge yourself while having fun. 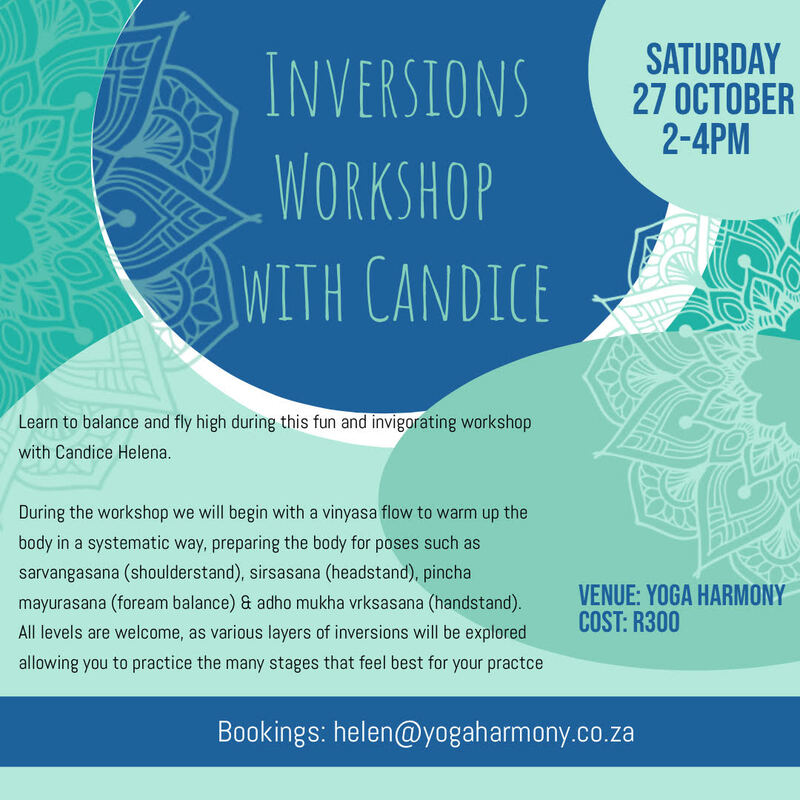 Please pre book to avoid disappointment contact helen@yogaharmony.co.za. Join Dalene for a series of eight workshops to explore the chakra system. Chakras are spinning vortices of energy existing in many dimensions. The value lies in using them as tools for insight into our lives, and using them to make sense of our lives. The Root / Base chakra is the first chakra and foundation of the system. It relates to the Earth element and all things solid and earthy. In this chakra we are involved with our bodies, health, survival. When this chakra is balanced we feel safe, secure, grounded, connected to the earth. We are living a prosperous life. When this chakra is out of balance fear rules, manifesting in all sorts of dis-ease in the body, mind and spirit. We will be doing a yoga set and meditation specific to each chakra, with the aim to move energy and bring balance. Cost: R100 per adult - R50 per child. A family yoga workshop to give you the opportunity to share in a yoga class with your children. Whether you'd like to spend time as a family, learn about children's yoga or just get out and about for an afternoon activity. We'll start with a children's yoga class and then get together for a mindful craft activity (more information is available on request). The craft materials will be provided which means that we'll need final numbers by 10 April, so please book your spaces by then! Children need to be between the ages of 4 and 12 to participate. Yin yoga, unlike dynamic Yang practices, is about slowing down and softening the body which can be a challenge in itself. Poses held for a longer period target our deepest tissues of the body, our connective tissues – the tendons, ligaments and deep fascia networks of the body – rather than the muscles. This results in increased circulation in the joints and improved flexibility. A more meditative approach to yoga, its goals are awareness of inner silence and bringing to light a universal interconnective quality. Come and explore the general principles and benefits of this quiet and simple practice. 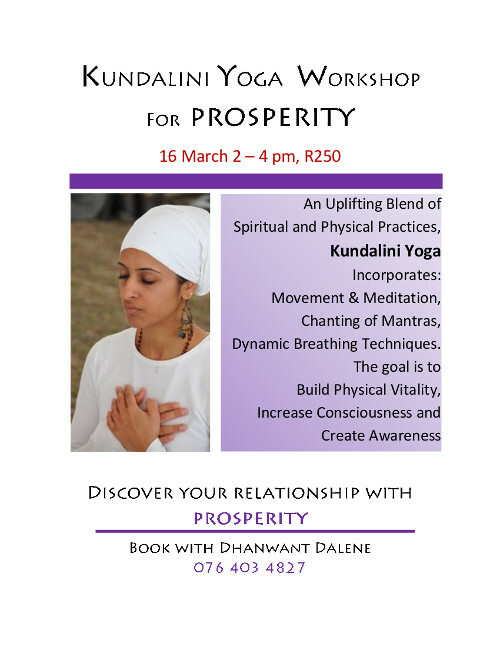 This workshop explores what prosperity is and how we relate to prosperity. We all have different ideas due to ideas planted in our heads by parents, caregivers, friends, community, etc. Sometimes we feel limited by perceived lack. Prosperity is what Flows in life, and we are going to connect to that Flow through with yoga, meditation and chanting. 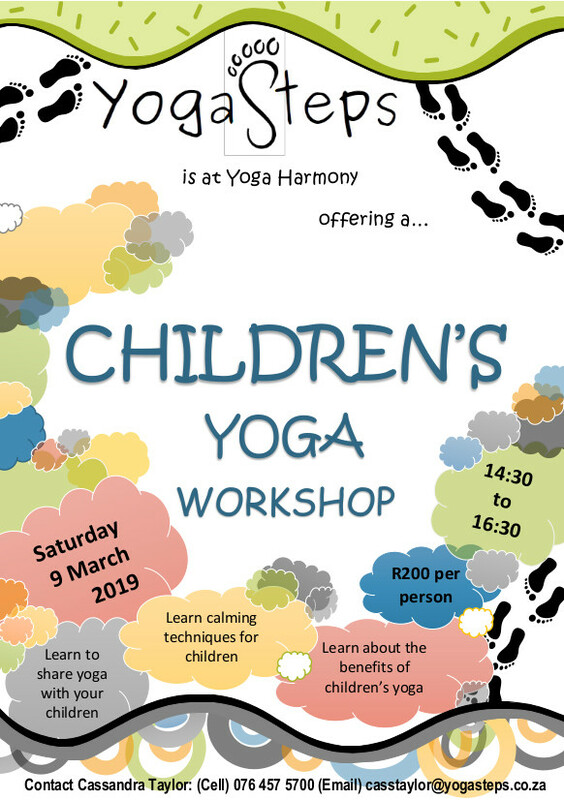 Yoga Harmony will be hosting Children’s Yoga on Friday afternoons from 12 April 2019. Join us on 9 March 2019 at 14:30 for two hours of information, imagination and fun ! An introductory children's yoga workshop aimed to give adults the chance to experience a children's yoga class! This one is for all adults (above the age of 18) who feel they'd like to tap into their inner child, or broaden their knowledge of yoga and yoga for children. 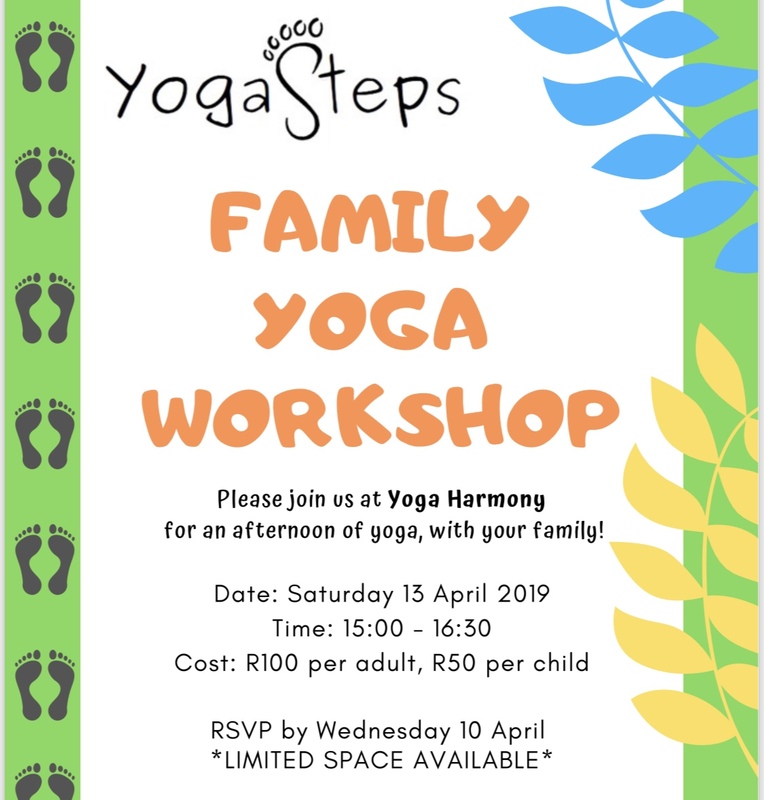 The workshop will start with a children's yoga class, followed by some general information on the benefits of children's yoga, calming techniques for children and how to share yoga with your own children, grandchildren, nieces or nephews. It will also be a great way for you to find out what is done in a children's yoga class - especially if you are interested in enrolling your little one. with Freda internationally trained at The House of Yoga in London and certified 200YTT Baptiste Vinyasa yoga teacher. Let's have fun and turn things upside down. 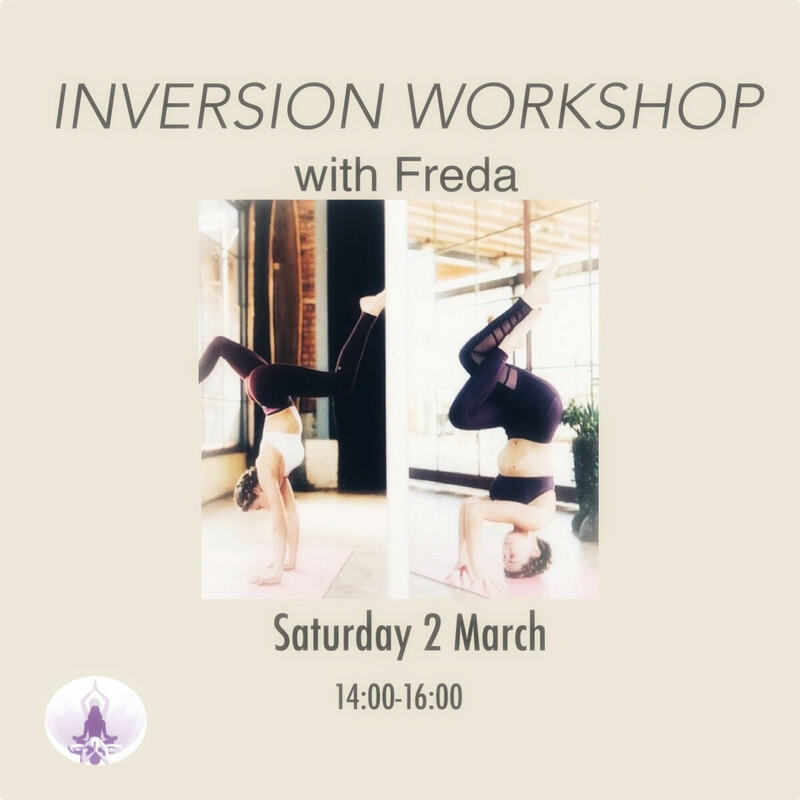 Join international yogini, Freda, for a 2 hour Inversions Workshop. You will play around with various asanas - head stands, shoulder stands, and hand stands - whilst advancing towards a floatingvinyasa. All levels are welcome. Inversions inspire flexibility, strength and courage, so take this chance and challenge yourself while having fun. 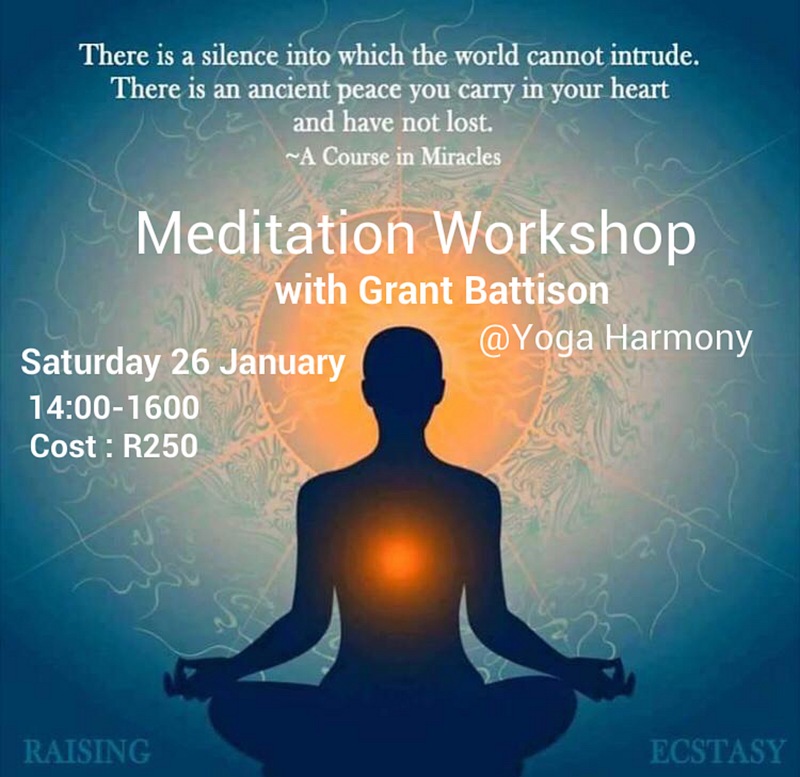 Join Grant for a comprehensive meditation workshop. The workshop covers all aspects of meditation and is ideal for newcomers to meditation as well as people returning to meditation or those having difficulty with their meditation. This workshop will inspire you to integrate meditation into your life. When the mind is calm, clear and focused you have a deeper understanding about who you are and the world around you. Grant is an experienced certified meditator, trained in India. “There is a silence into which the world cannot intrude. There is an ancient peace you carry in your heart and have not lost.” - A Course in Miracles. Back by popular demand, sacred musicians Danyal Swan and Denzil Wait return to Pretoria to take you through another immersive journey through the wondrous world that is sound. Bringing their unique individual musical skill sets together, they will be exploring various sound and musical elements including, but not limited to, Tibetan singing bowls, bells and chimes, percussive to melodic instruments, and the original musical instrument, the voice. 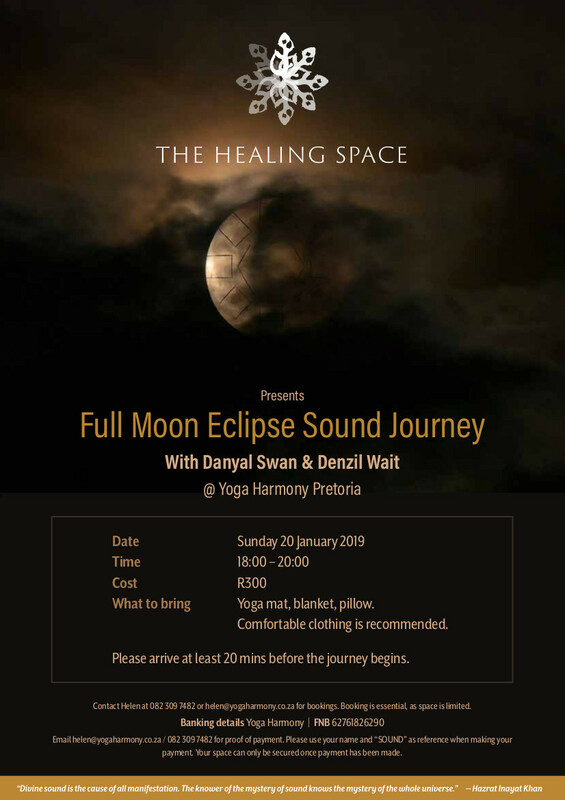 We invite you to come and indulge your spirit in this unique auditory, meditative and healing experience, as we kick off into the pace of the new year, supported by an epic and beautiful full moon eclipse. What to bring: Yoga mat, blanket, pillow. Comfortable clothing is recommended. Please arrive 20 mins before the journey begins. Booking is essential, as space is limited. helen@yogaharmony.co.za / 082 309 7482 for proof of payment. Please use your name and “SOUND” as reference when making your payment. Your space can only be secured once payment has been made. In this workshop we will be working through the basics of Yoga, breaking down the fundamental poses and sequences that make up a general Yoga class or practice. As we flow through the beginners class, pose by pose, we will discuss the benefits of the Yoga postures; Savasana(Meditation), Pranayama(Breathing techniques) as well as Sun Salutation. Included will be modifications on these postures, ensuring that the class fits your level of experience.The purpose of this workshop is to provide our attendees with the confidence and knowledge to tackle any Yoga class they would previously feel too incapable of joining. "The hardest part of any journey is taking that first step". Let Sabrina(Hatha and and Vinyasa based Yoga teacher) help you! She'll be guiding you through these early steps by teaching you more about this enlightening practice and the positive impact it will have on your life. 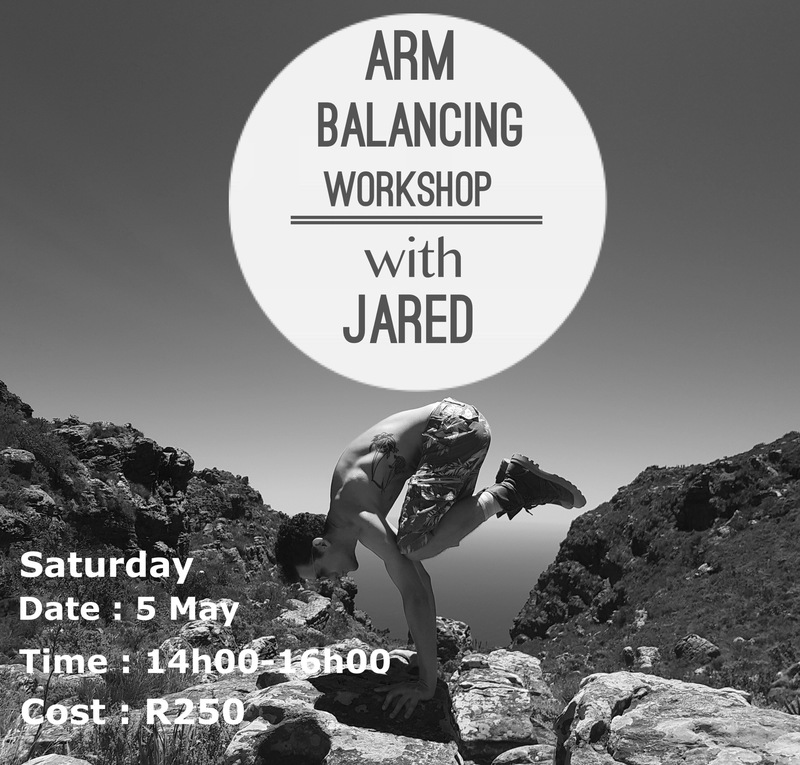 Workshop for Beginners and experienced yogis alike with Jared Musiker. Jared Musiker is a Cape Town based yoga instructor teaching at some of the city’s most sought after yoga spaces. He is known for his poetic and challenging sequences, with one foot rooted in traditional philosophy and the the other standing on the cutting edge of current wisdom. Jared has taught and studied yoga internationally and has practiced under some renowned teachers such as Dylan Werner and Simon Borg-Olivier. Recently in 2017, he completed further advanced teacher training with the infamous Ana Forrest, who is one of the most respected yogis of today and also ordained medicine woman. Alongside Yoga, Jared is an interdisciplinary performer and loyal devotee of the arts. 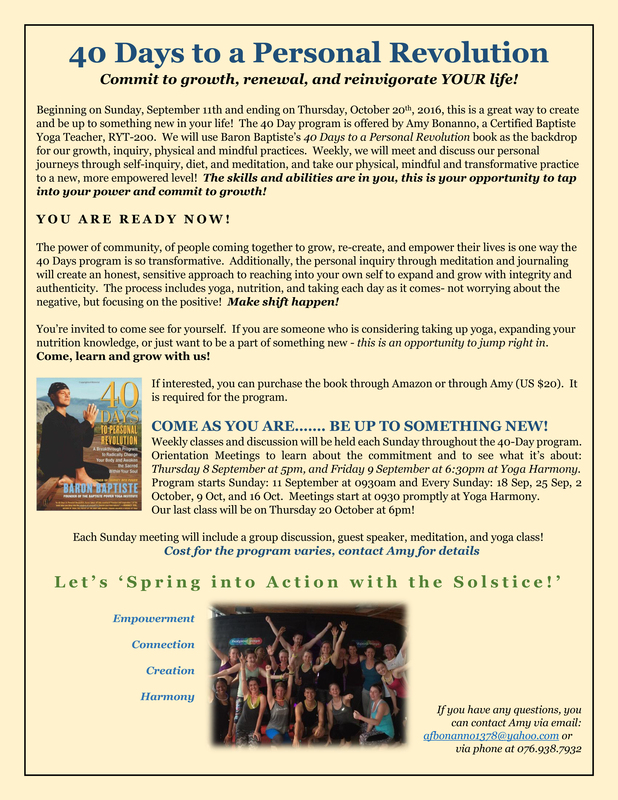 Join Jared and learn or relearn about the fundamentals of yoga. practiced alike, returning to the basics can be humbling as it is vital. 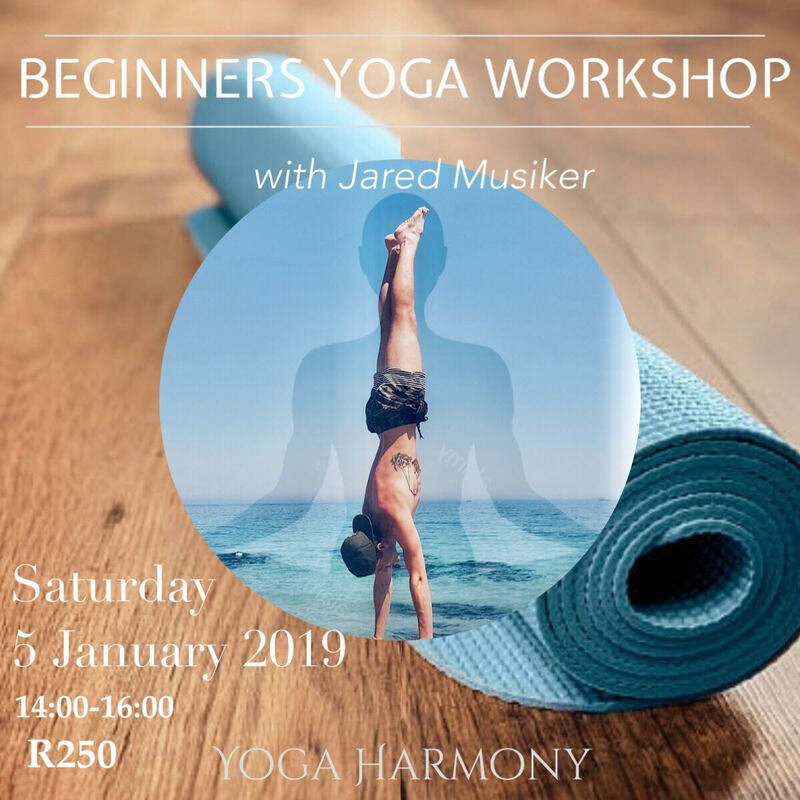 Of triangles, pyramids & warriors, Jared Musiker lays solid Yogic foundations for the New Year with an exciting workshop that explores the natural architecture of the body. When aligning the mind with the breath and the posture, one can achieve almost anything. Building understanding of the universal yoga poses whilst learning how to breathe life into goal setting on & off the mat. Most importantly, develop an awareness of how the most simple practices work the best, letting the yoga do its work. Towards the end of the workshop, there will be also be a guided meditation to equip one with the tools to start a personal meditation practice. 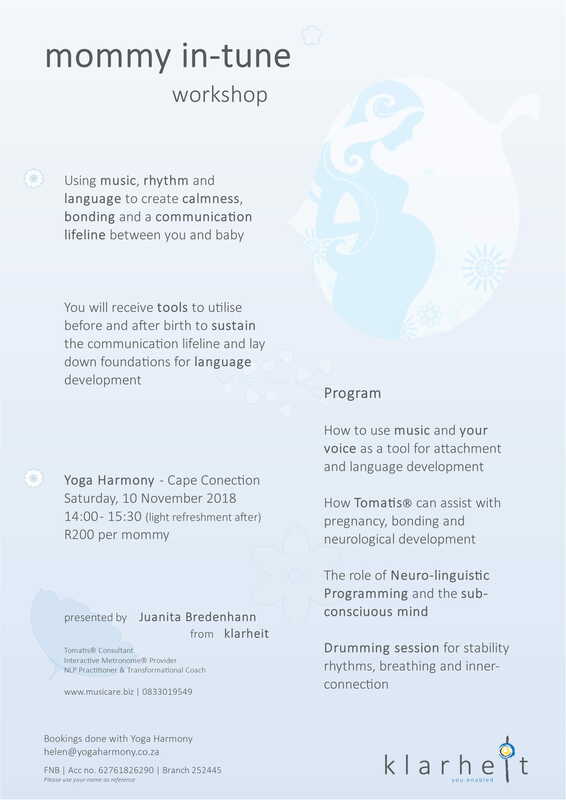 Mommy in-Tune workshop with Juanita Bredenhann. Candice has been practicing yoga since 2011. She is 200hr Yoga Alliance certified in Vinyasa & Forrest Yoga. Candice started her journey through yoga as a way to discover more about life, herself and the mind and as that of others. Yoga is a lifestyle to her and has inspired her in so many aspects of her life. 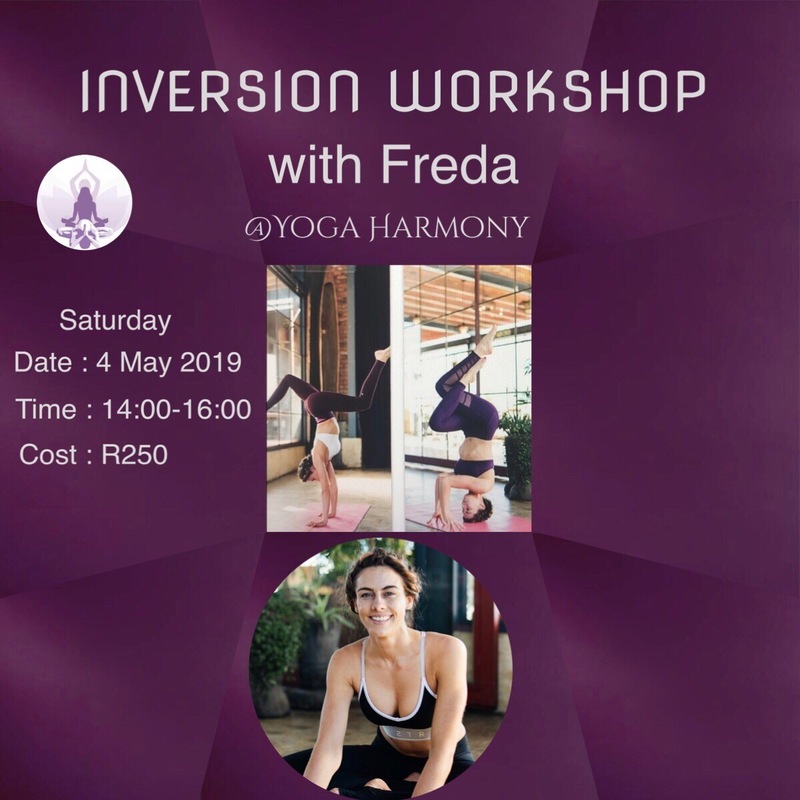 Learn how to prepare and stay safe in inversion yoga poses and learn about the benefits and fundamental principles of inversions. Inversions are yoga poses where the heart is higher from the ground than the head. Purposely turning ourselves upside down is contrary to our physical nature and yet the benefits are many and profound. All levels are welcome as various layers of inversions are explained allowing you to practice the many stages that feels best for your practice. • Improves lymph flow, Detoxifies • Strengthens core, spine, arms and shoulders • Energizes and Revitalizes • Improves balance • Builds confidence • Gives us a new perspective on life. Join musicians Danyal Swan and Denzil Wait on an immersive journey through the wondrous world that is sound. 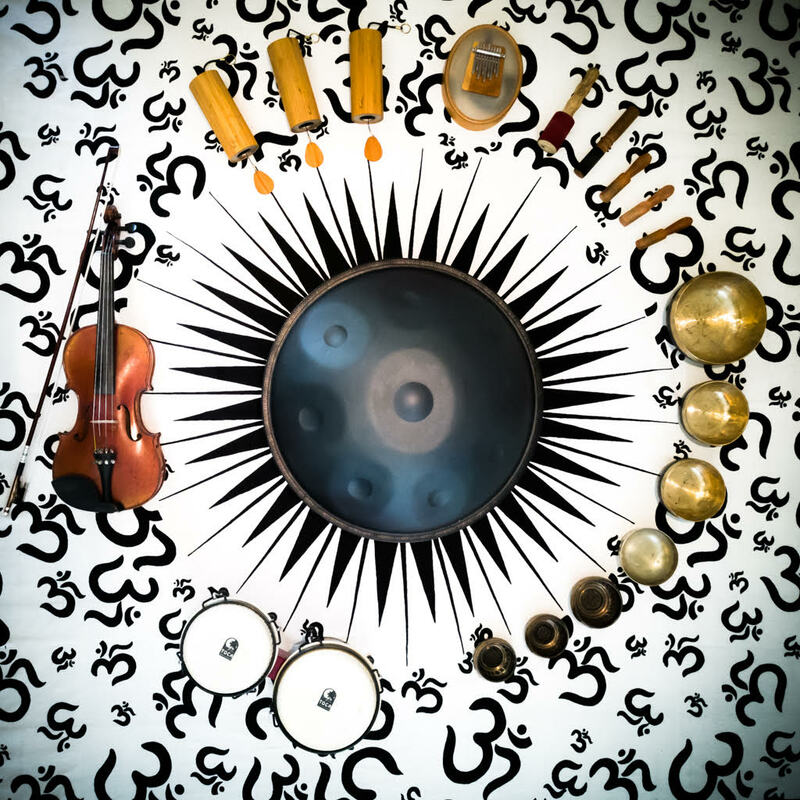 Bringing their unique individual musical skill sets together, they will be exploring various sound and musical elements including, but not limited to, Tibetan singing bowls, bells and chimes, percussive to melodic instruments, and the original musical instrument, the voice. We invite you to come and indulge your spirit in this unique auditory, meditative and healing experience, at the turn of the 2018 Spring Equinox, celebrating the cycle of new life as we enter the change of season into the summer months. 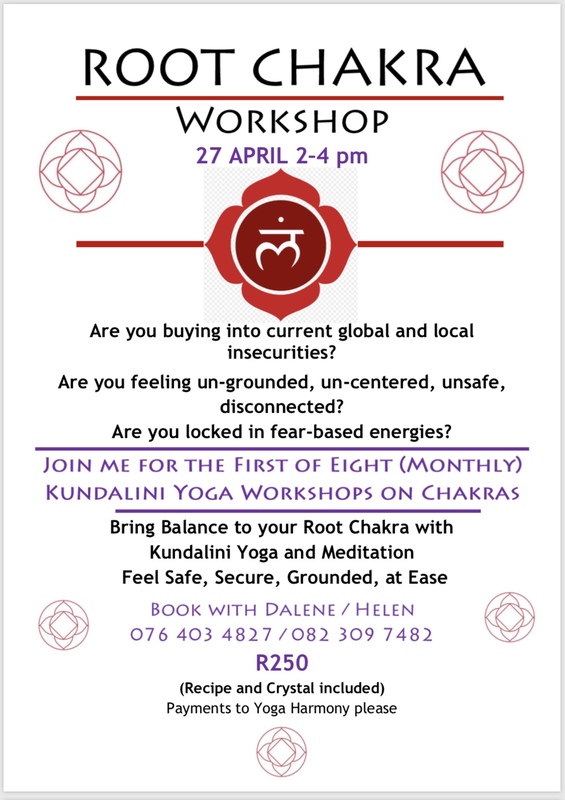 Contact Danyal at 076 859 6006 or danyal@thehealingspace.co.za for bookings. The word ‘chakra’ is derived from the sanskrit word meaning ‘wheel’. Literally translated it means ‘Wheel of spinning Energy’. A chakra is like a whirling, vortex-like, powerhouse of energy. Within our bodies, you have seven of these major energy centres and many more minor ones. These swirling wheels of energy correspond to massive nerve centers in the body. Each of the seven main chakras contains bundles of nerves and major organs as well as our psychological, emotional, and spiritual states of being. Join us for a wonderful basic introduction to the 7 main chakras for all levels. 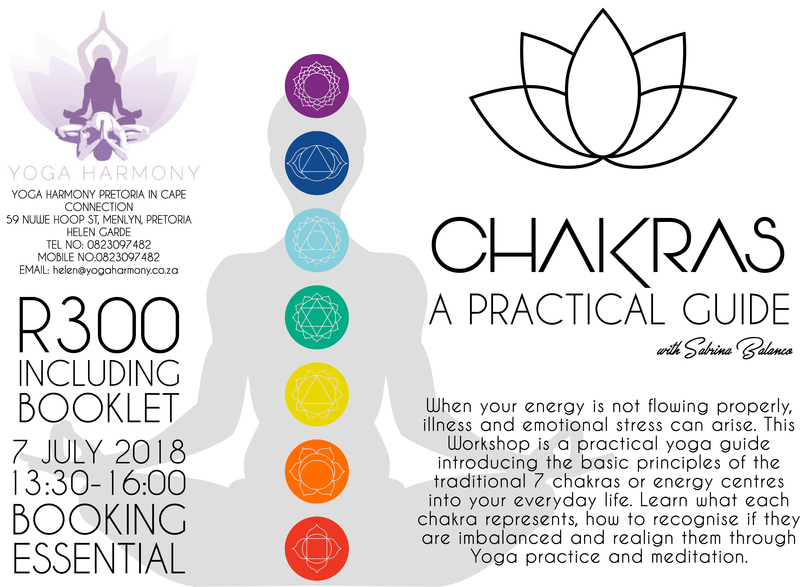 We will go through each chakra, learn how it affects the body and mind and what yoga poses and pranayama we can use to activate and realign our chakras or energy centres. The booklet will include information on 4 pranayama/ breathing techniques, the traditional Hatha sun salutation and information on each chakra and the poses that engage that chakra. As well as a morning and evening routine that one can do at home. Sabrina Balanco is a Hatha based yoga teacher, and fell in love with all things yoga during her teacher training in 2016 and that love and passion only continues to grow with each day, learning and sharing as she goes along. You can find Sabrina on Facebook and Instagram @asanatribe. Meditation is a vital way to purify and quiet the mind, thus rejuvenating the body. 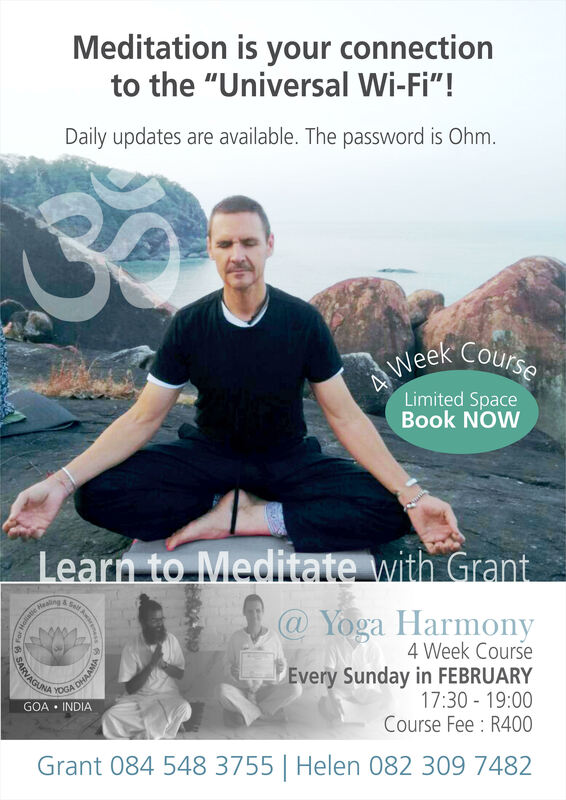 Learn to meditate with Grant. 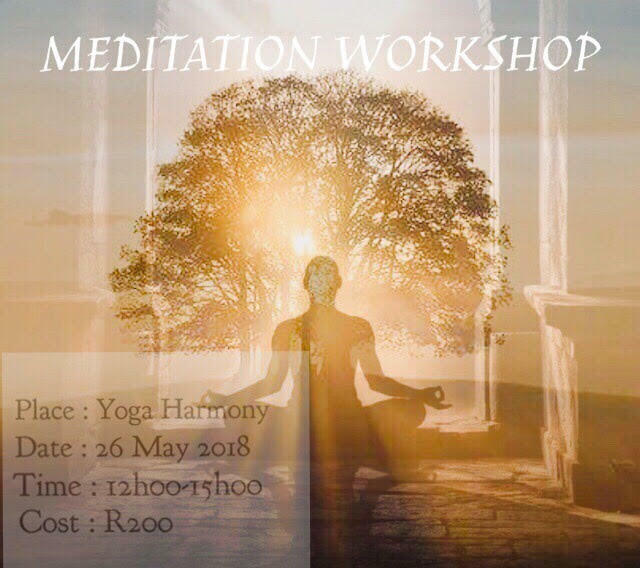 Join us for a meditation workshop on Saturday 26 May at Yoga Harmony. The workshop covers all aspects of meditation and is designed to teach you to meditate on your own. Grant is an experienced meditator and did his meditation teacher training in India. The workshop is a combination of ancient wisdom with modern science . Increased focus. Reduced anxiety. Increased creativity. Reduced stress. Increased memory. Reduced pain. Increased compassion. Reduced depression. Increased productivity. Emotional balance. Revitalise your mind, body and spirit with one of yoga’s most invigorating aspects: arm balances. Arm-balancing is more than just an uplifting practice, it serves as medicine to heavy hearts and burdened brains. Jared Musiker presents an accessible and fun approach to balancing upside-down in a Forrest infused vinyasa workshop. He will introduce the methods of the breathing, maintaining support and building upper torso strength required to elevate your practice to a new level. This workshop offers break through style techniques which will leave you floating, whether or not you have ever lifted your feet off the ground. 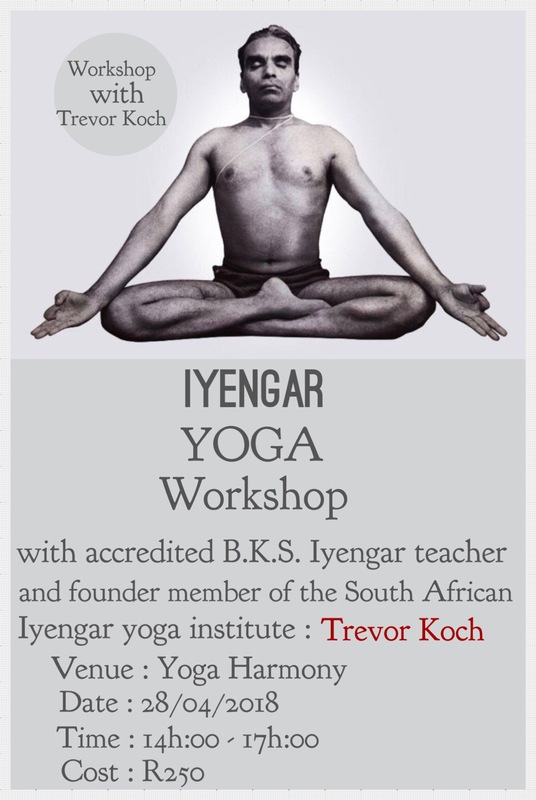 Iyengar workshop with accredited B. K. S. Iyengar yoga teacher and founder member of the South African Ramanani Iyengar institute - Trevor Koch. Trevor studied and trained in India as a Iyengar teacher with B. K. S. Iyengar. Description – Meditation is one of the greatest gifts you can give to yourself. The course covers all aspects of meditation and is ideal for newcomers to meditation as well as people returning to the practice and even for experienced meditators. Meditation has been my passion for years and having just returned from India, where I completed my meditation teacher training, it will be my honour to guide you in this subtle art. Workshop with Natasha - qualified Therapeutic Reflexologist and Holistic Therapist completed her 2 Years Yoga Teacher Training in 2012 and has been teaching yoga for over six years. Two hour workshop 10:30am to 12:30am. This workshop is for the beginner to gain more knowledge on the ancient practice of yoga or for all levels who would like a refresh and restart on their journey, providing them with the groundwork and tools to remain focused and engaged. 5. Explanation on the history of yoga. 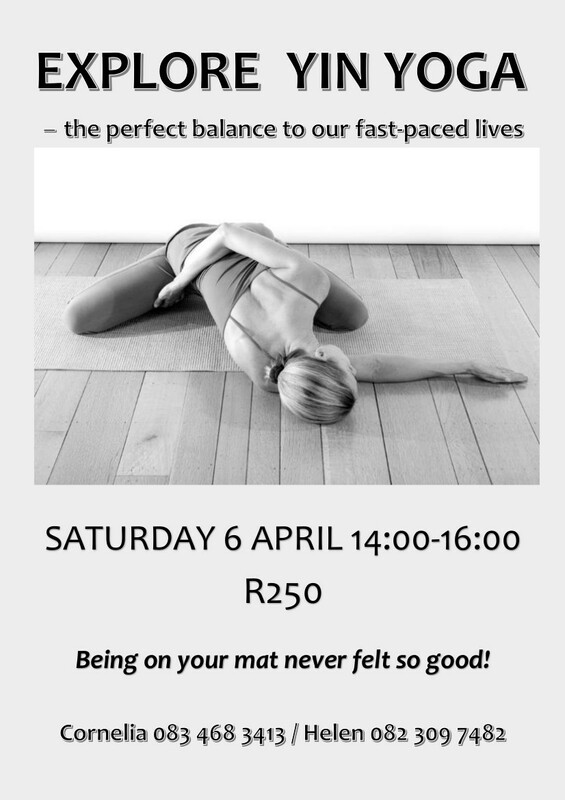 Bookings are essential contact helen@yogaharmony.co.za or 0923097482. Anatomy workshops, Manuals, DVD’s, Lectures, Guest speakers, understanding of asanas, Vinyasa and Yin Yoga with emphasis on transformation, Yogic Philosophy, Mindfulness, Subtle Body Technique Skills, Meditation, Pranayama, Bandhas, Mudras and much more. Ilse vd Walt certified yoga teacher from Zanzibar will be hosting and Island Flow Workshop at Yoga Harmony. This two hour workshop will include : The fundamentals of yoga postures integrated with breath, a one hour Vinyasa class and tips on how to transition into more challenging asanas and arm balancing. Meditation. 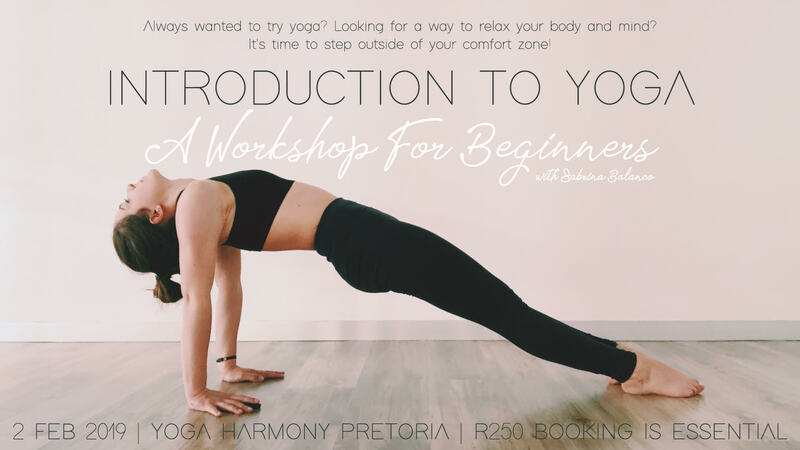 Bookings are essential contact helen@yogaharmony.co.za. In this class you will be taught about the history of Reiki, how to give a Reiki treatment to other people as well as to yourself and you will receive 4 attunements. This will enable the Reiki energy to flow again. After the first degree Reiki class you will be able to give Reiki to yourself as well as to others. With Lois and Ben qualified AYFit Teachers and affiliated with AcroYoga International as a AcroYoga Jambassador. Acro Yoga is the harmonious combination of the fun and energetic side of acrobatics, the wisdom and connectivity of Yoga and the loving kindness and healing attributes of the partnership through Thai massage. Come along and enjoy this playful and symbiotic relationship using Yoga and acrobatics to share in Kula - community. Using a base, spotter and flyer. The experience and environment becomes a place to build strength, openness and love where one can support and be supported, trust and be trusted and liberate oneself from fear. Tuesday 27 June from 7am to 9am. Yoga Harmony welcomes Dave back to our studio. Budokon - Japanese for " The way of the warrior " Budokon- A beautiful synergy between yoga, animal locomotion and martial arts. Experience fusion of these energies and get to explore more about yourself as well as your yoga practice. Allow yourself to feel the mindful fluidity of Budokon. You will be amazed as to what your body is capable of doing in this moving meditative practice - Yoga Harmony. Book your space as soon as possible. Create space and agility through the whole body. Through stress of everyday life, sitting for long hours in offices and cars tension is often lodged in the hips. This workshop will delve deeply into the physical and emotional layers of the hips, loosen tight hips, improve your range of motion, circulation and alleviate back pain. Two hour workshop ending with a thirty minute meditation in savanna. Bookings are necessary. 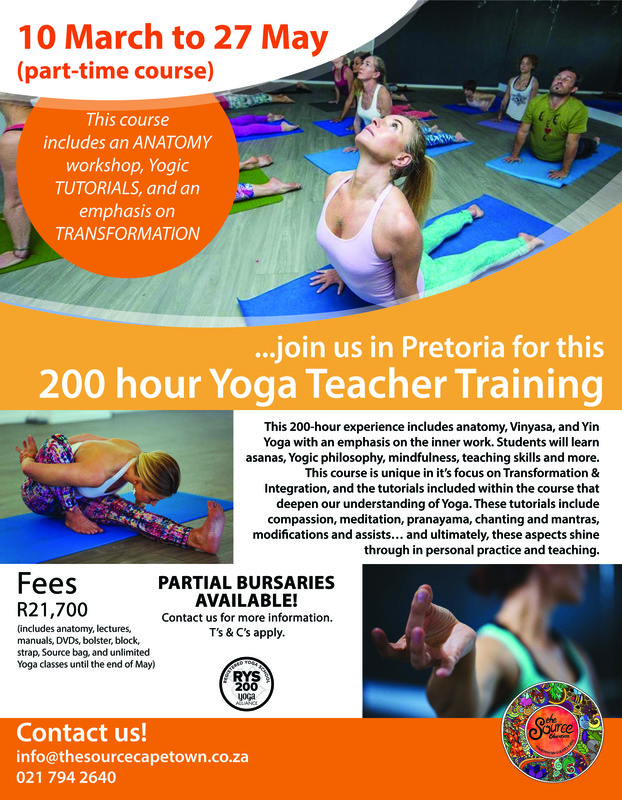 Please contact 0823097482 or email helen@yogaharmony.co.za. 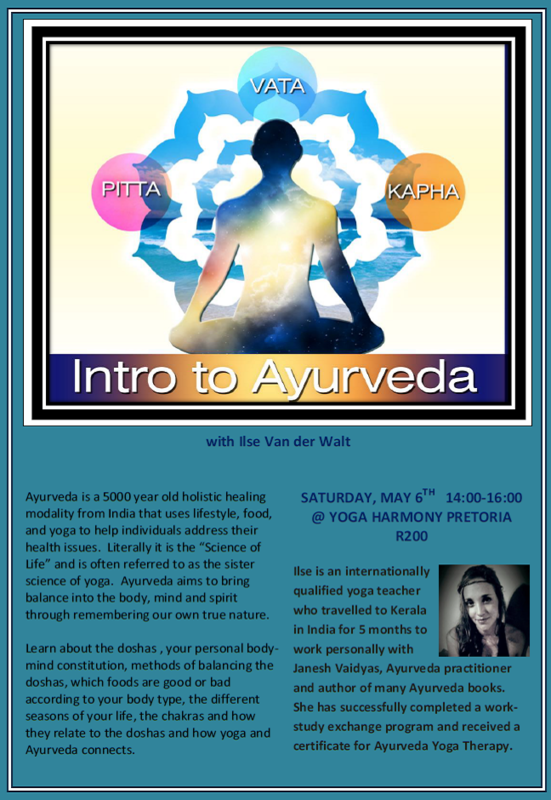 Due to the Ayurveda workshop being fully on 6 May Yoga Harmony is hosting a repeat of the workshop on Saturday 13 May from 2pm - 4pm. Bookings are essential. 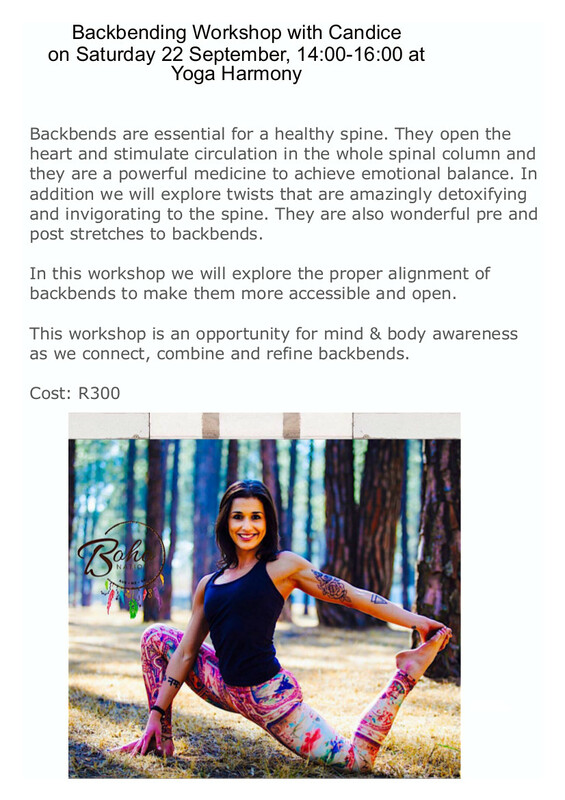 Contact 0823097482 or email helen@yogaharmony.co.za. Thousands of years before modern medicine provided scientific evidence for the mind-body connection, the sages of India developed Ayurveda, which continues to be one of the worlds’ most sophisticated and powerful mind-body health systems. More than a mere system of treating illness, Ayurveda is a science of life (Ayur = life, Veda = science or knowledge). It offers a body of wisdom designed to help people stay vibrant and healthy while realizing their full human potential. Join Ilse as we delve deeper into this ancient healing system of India and learn how to apply these principles to encance the quality of your life. 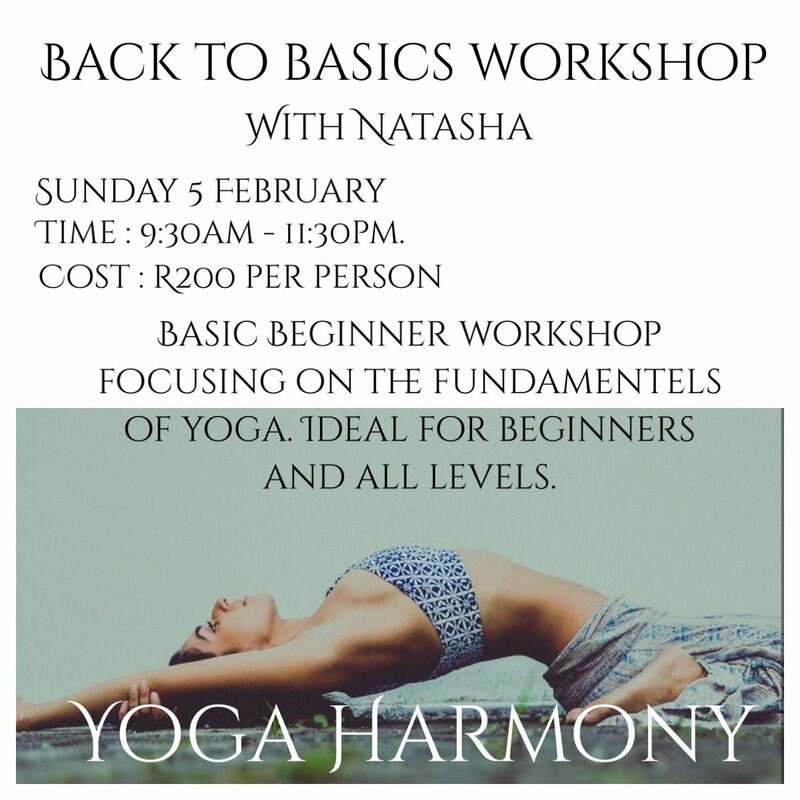 Bookings are required contact 0823097482 or helen@yogaharmony.co.za. Suitable for Beginners as well as all levels to restart and refresh. 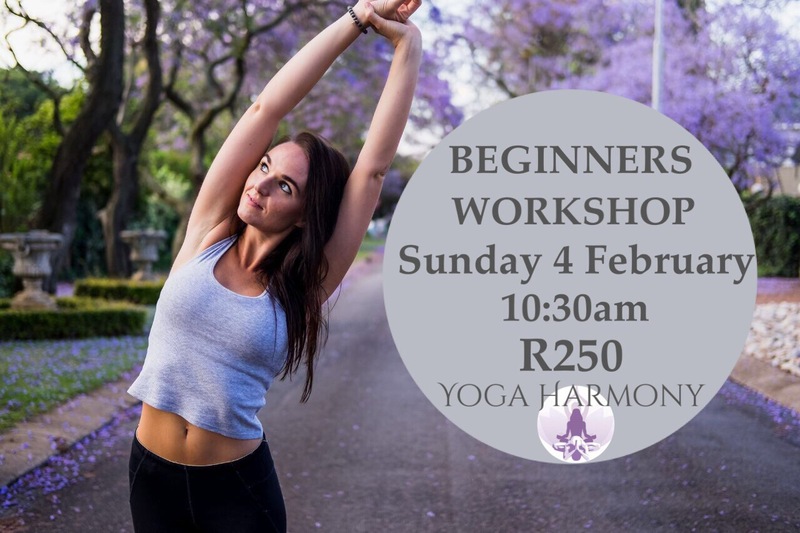 This workshop will teach the beginner the essentials they need to start them on their yoga journey, providing them with the groundwork to attend regular classes. 1. The basics of yoga and why yoga is an essential part of life. 2. Pranayama ( breathing techniques ) – Breath of life. Interested in expanding and empowering your yoga practice? Do you want to be and feel more powerful in asana? 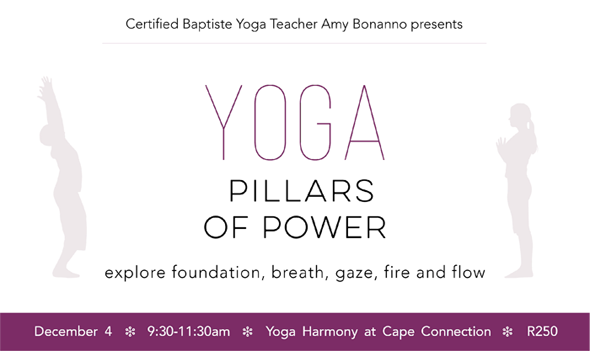 Join me for this special two hour workshop that explores the five pillars of Baptiste Yoga. This workshop will give you the tools you need to explore your foundation, breath, gaze, heat, and flow in each pose in a typical vinyasa yoga class. The workshop will include an asana practice and an exploration of the tools and capabilities that reside within yourself to empower and strengthen your body and mind on your mat and off your mat! 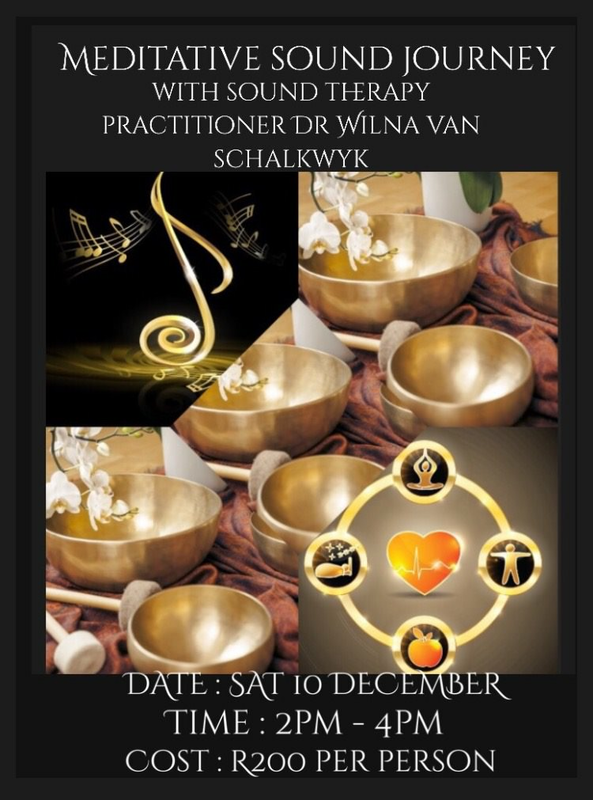 Sound Therapy Practitioner Dr Wilna Dirkse van Schalkwyk will present her Sound Meditation Workshop on Saturday 10 December from 2pm-4pm at Yoga Harmony. She personally guides meditations and combines them with the relaxing sounds of Tibetan and quartz crystal singing bowls, hand held drum and voice to create a space to reach inner silence. Ignite your fire, change old habits and create space for something new !! Starting 11 September-20 October 2016 – 6x Sundays at 9:30am. The program is based on Baron Baptiste’s book of the same title 40 Days to a Personal Revolution including • Yoga • Meditation • Diet Awareness • Inquiry and Reflection. The book will need to be obtained and is available on kindle or through Amazon.com at R250. Contact Amy for any questions at afbonanno1378@yahoo.com. or call Amy on 0769387932. Saturday 5 November from 9:30am to 11:30am. Cost R250. 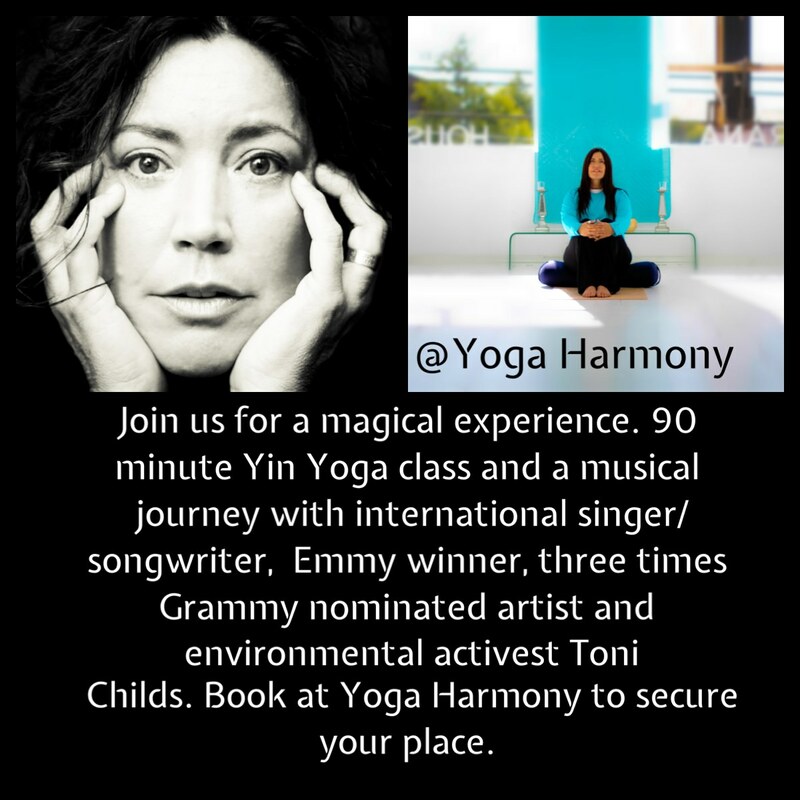 Toni Childs is visiting South Africa and will be hosting a 90 minute Yin Yoga class together with a magical music experience at Yoga Harmony Pretoria on Friday morning 13 May at 10:30 pm. Cost R250. Bookings are essential. Leading sacred world music duo Yusuf and Lynne producers and performers are returning to Yoga Harmony after a spectacular musical journey in October last year. They will perform their unique brand of multilingual sacred world music in through music of the heart. The couple have toured worldwide, their music has been described as ethereal, uplifting and allows listeners to access their inner world through original compositions that blends ancient chants in Sanskrit, Aramaic, Hebrew and French with classically orchestrated sounds and rhythms. 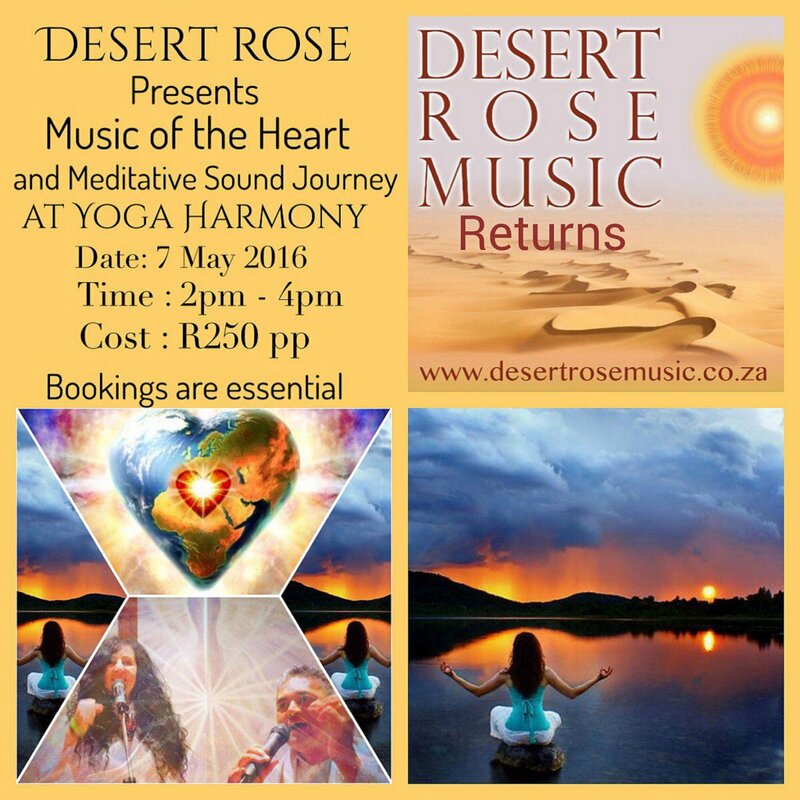 Bookings are essential contact helen@yogaharmony.co.za or call 0823097482.